The Stageline Budget guitar stand in black will hold acoustic, bass or electric guitars. This guitar stand has rubber tubing to protect your guitar. The free standing bucket adjusts to hold odd shaped guitars. Its rugged design is great for portability. The stand legs and neck fold for easy transport. 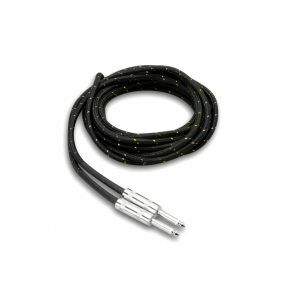 The GS2445 will fit any Electric Guitar, Acoustic Guitar, or Bass Guitar. 4.2" x 21.7" x 7.5"